The colorful classroom of TBD in Chile. With little more than 20 students—comprised almost entirely of trans children and volunteering teachers—the Chilean school, Escuela Amaranta Gomez, aims to unite a society that is tearing itself apart. The chairs in the classroom of the Escuela Amaranta Gomez are organized in a circle. The crowd of children takes a while to simmer down, their ages ranging from 7 to 16. Tall, thin, and beautiful, Miss Antonia Jorquera presides before them, wearing a crown and a sash. She waves to the girls, who look at her agape as if she was a Disney princess. Antonia talks about her childhood in the Chilean south, where there was little to no television. A time when she adored pink. “Like me!” a girl answers. Antonia laughs. “I’d also put on my mom’s high heels,” she continues. “Did you do it in hiding?” another girl asks. “My mom lets me,” another girl brags. “My mom would also let me,” another voice joins. “A beautiful woman, a diva!” answer some girls. “It appears in the video games, whenever I miss a shot,” jokes a boy. Jorquera is Miss Chile Trans, and minutes later will be joined by Fernanda Muñoz, Chile’s representative for Miss Trans Star International. They’re there to talk to the children as a part of their Civil Formation Workshop, one of the landmark classes in this trans feminist school. Profe Romina and most of the children here are transgender. 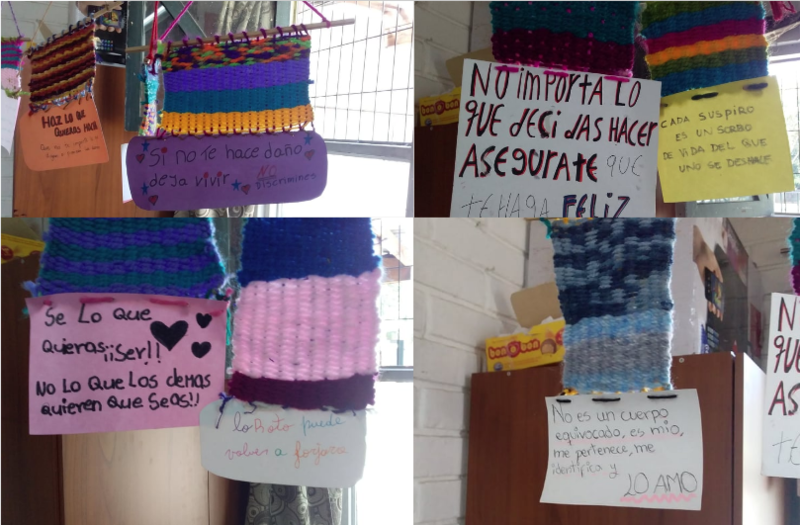 Affirmations abound in the classroom of Escuela Amaranta Gomez. Maturana says she didn’t realize the radical immersion she would undergo when she found herself fully committed to the cause. She began her journey by participating with her daughter—who is now a teenager—wherever and whenever she could, always following Silva’s lead. But eventually, she got asked to give talks by herself; she compares her change of worldview with her daughter’s transformation. As a parent, Maturana recognizes the difficulty of accepting the reality that once your child begins to transition, their life in school could inevitably become more difficult before becoming better. There’s a lot of self convincing: It’s gonna be alright, they’re going to respect my kid. Usually, before trans children officially enter any school, their parents speak with the headmaster in order to explain the need for the Foundation to preemptively address the students to raise awareness and respect through speeches.“The first thing the director often says is, ‘But the parents, they won’t understand’… I don’t believe any excuse to be valid, but there’s no one who knows parents better than the directors,” Maturana says. Parents are—painfully—often the first to object to the speeches the Selenna Foundation gives. “Why should my child learn this stuff?” they complain. Maturana says she finds this rather ironic, considering that the Foundation has received calls from schools regarding “concerned” parents who’ve reported that their children are dating a trans classmate. “I think parents can be even more screwed up than the kids,” Ximena posits. The Misses’ visit became venting ground for both them and the children on their experiences in the school system. A trans girl of around ten years talked about the time a teacher shoved his foot into her path, tripping her onto the ground. Another trans girl remembers a series of violent bullying episodes. A gay friend of hers was beaten and bullied so much he hid in the bathroom and broke his finger punching the wall out of rage; she described a second episode where she lashed out and beat up a girl after being bullied herself. Teacher Romina intervenes quickly at the tail end of these recollections to remind the children that violence isn’t the answer, which was quickly objected to by another student. She felt it is only natural to lash out when you suffer from so much rage. Romina knows something about pent up anger. A history teacher and trans activist, she put her pedagogy studies on hold for ten years in order to transit successfully. She finally got her degree two years ago, just after she got to change her name. Around the time of our conversation, she was going to retrieve her diploma with her new name as well. Parents often recognize that their child can’t handle being in the same school they previously attended while they’re also in transition, so they take them out and let their children stay home. Some keep up by taking standardized tests, but others don’t even do that. “There’s a kid here [In the Amaranta Gómez School] who’s 16 and is about to enter fifth grade,” says Maturana. For years the child would constantly change schools, but only ever lasted a few months before giving up. With 22 children, the classes are divided in two, according to age. The day is divided in three modules and, according to the day they may have language, math, science, history or English. They also have workshops, which can range from art therapy and yoga, to programming and the aforementioned Civil Formation. Such a radical vision of school also means democratizing issues such as content. What do the kids want to learn? When I was interviewing Pedro, they were divided into groups of three tasked with drawing a comic on a different moment in colonial history. There’s a reason it’s called Escuela, and not Colegio, two words often looked as synonyms in Spanish. If it’s Colegio, it means it has the approval of the Education Ministry. The approval of the Education Ministry means it fulfills certain requirements, which Silva and Maturana aren’t sure if they want to accomplish or abide by yet. The environment is celebrated alongside Communist politician and Pinochet critic Gladys Marín. Nevertheless, the Minister, Marcela Cubillos, actually came once and handed out a prize. “I forgot the name,” says Maturana, “but it was like ‘best relationship among the students. '” She still seems puzzled by the visit and no wonder, given that Cubillos is so conservative that when she was a Congresswoman, she voted against the legalization of divorce in 2004. What’s most important about being recognized by the Ministry, however, is that the school receives financing by the State. As of this moment, all eight teachers are volunteers, and the children’s families don’t have to pay anything. Meanwhile, they’ve found financing through two international NGOs, one from the United States, and another from Switzerland. Now they’re going to apply to the International Trans Fund. “When we went to the Civil Registry, there were a lot of religioses screaming at us,” remembers a girl, speaking of the bigoted protesters using their gender inclusive neutral form created by the trans community. As young as she is, she shows empathy even for those who are not willing to grant her the same. Maturana doesn’t remember the episode in the Civil Registry, but she does remember a time they had a field trip to Congress. It was the first time protesters aimed their ire at the children. Religioses. Luckily, there haven’t been any physical attacks, and Maturana believes the neighborhood has something to do with it. They feel safe there. Unlike other quarters in Santiago, this one boasts a hot history. The last bastion of social housing in Chile, the National Stadium nearby—created during the ‘60s—had served as a camp for torture and extermination during the days after the coup. It was also there where, years later, a dozen freedom fighters in hiding were slaughtered by dictatorship soldiers. After the damages suffered during the 2010 earthquake, the neighborhood organized itself into an assembly that still exists today and offers services such as cleaning brigades, newsletters, recreational activities, and a mobile library. For the moment, though, they’re still uneasy about posting their exact address. Like so many places in the world, Chile finds itself in the crosshairs of two colliding forces. On one side, not only did our own Daniela Vega became the first trans person to present in the 2018 Academy Awards, but the film she starred in, A Fantastic Woman, won the Best Foreign Film Category. After a heavy debate, the Gender Identity Law was also approved, a process that until this legislation passed, could take years. (You can thank the 14 years limit to the concerned conservatives who, as always, issued their “think of the children” shields).